As many of you know, I am a busy mom of four little ones. All of my babies were breastfed for at least a year and I absolutely LOVE breastfeeding. Most, if not all of my babies were also very distracted babies when it was time to eat and it was always a challenge to nurse discreetly at times. I remember I was on an airplane with my first baby and I would nurse during take-offs and landings to keep her ears from hurting. Well, I always nurse with a cover on when in public and my Hannah hated to be covered. Being that she was my first baby, I wasn't too handy with a cover and how to hang onto it and, well, lets just say she flashed the passengers behind us. HAHA! It was quite an embarrassing moment for me, but one that I can now look back on and laugh about. I am a bit more seasoned now that I have nursed a few more babies and am pretty good at keeping a nursing cover on a baby who is flailing their arms around. It's challenging, but not as difficult as it used to be. Created in 2005, Mommy Necklaces is the original line of jewelry inspired by motherhood. Born out of the frustration shared by countless mothers in breastfeeding, the company began with a simple observation; A bright, engaging necklace could make a difference in focusing a distracted baby. Since the creation of the first necklace, two principles have guided our product lines. First, the necklaces must be safe and durable. Able to withstand the pulling and twiddling of feeding time. Mommy Necklaces include durable cording, non-toxic beads and a patterned closure that is designed for even the most determined baby. Second, we are keenly aware that early motherhood is a beautiful, wonderful time that is cherished by many women around the world. However, it can also be a time when it is easy to lose yourself and your sense of beauty and style. While safe and functional, all Mommy Necklaces are created by moms who understand that you are still a beautiful, passionate, inspiring woman in addition to being a mom. Today, Mommy Necklaces are found on dressers around the world. And while originally designed for breastfeeding mothers, they have become so much more to so many women. Whatever your style, season in life, or mood, we invite you to discover why Mommy Necklaces IS jewelry, justified. I had a hand-painted nursing necklace given to me when my second baby was born and I loved it. The only issue I had with it was that anytime it got near my son's mouth, the paint would come off onto his face. It was totally safe and non-toxic but still, he would have a blue, green and purple face after playing with my necklace. I hated the mess, but loved the concept of a necklace for my little one to play with while nursing. So, for this review I chose to receive Dangling Donut Strand and I chose the Promise design. They also sent me a lovely blue Teether Donut add-on. I love this!! This design is one of many and contains some beautiful, bright colors. Have you ever worn a necklace only to have a baby pull on it and it breaks? It has happened to me and I don't typically wear necklaces when I have babies. I have lovely necklaces, but am too afraid of them breaking. Well, this is one of the reasons I love this particular brand of mommy necklaces. These necklaces are designed with a custom break-away closure that will automatically break away if pulled too hard. This way, the necklace itself won't break but the clasp will open. The Dangling Donut Strands come with a donut pendant that can be changed out if you want a different color or design. I absolutely LOVE the teether pendant. It is the perfect texture for my little teething 7 month old. She puts everything into her mouth and this is something that she can play with while I hold and nurse her. 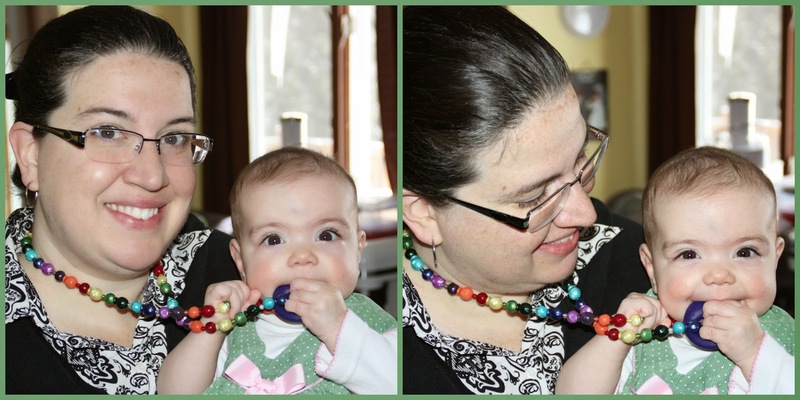 The reason I chose the Promise design was because my babies have always loved brightly colored objects and the beads on this necklace are so bright and colorful. All the beads that are used in the Mommy Necklaces are made in the USA, are non-toxic and are tested for lead and other heavy metals. This isn't your typical costume jewelry, moms. These are high-quality pieces of jewelry that will withstand motherhood like no other. Designed by moms---for moms, they are amazing. So, if you would like to check out this and other lovely necklaces, bracelets and other accessories, be sure to visit Mommy Necklaces. They have just about every color you can imagine and they can cater to even the pickiest of jewelry wearers. This necklace has helped my busy little breastfeeder be less distracted and she just loves the teether donut. It has also helped her to not pinch me so much while feeding...her little fingers hurt sooo bad sometimes! I wore my Mommy Necklace to church today and baby Rebekah played with it the entire time. People were complimenting on the beautiful colors of the necklace too and when they found out that it was specifically for the baby, they were so impressed! I would definitely recommend this company to any mom out there who needs a distraction for their baby, whether it be during nursing/feeding time or just for an outing. They are great for anytime! Disclaimer: I received no monetary compensation for this post. I did receive a free Mommy Necklace for review purposes. All quotes and stock photos are from the Mommy Necklaces website and email. Prize is being provided and shipped by the sponsor. This blog is not responsible for lost, stolen or damaged prizes. All thoughts and opinions are 100% mine. 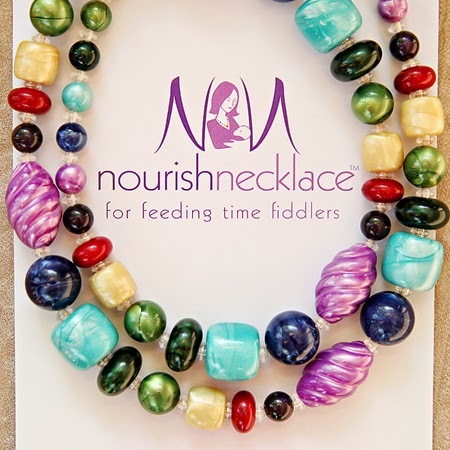 I love the blue accent nourish necklace. It is really pretty and an ingenious idea. I like both 'Cheer' and 'Gloss' a lot! I like Epic. I think it is pretty. All are cute though. I like the "Cheer" one.